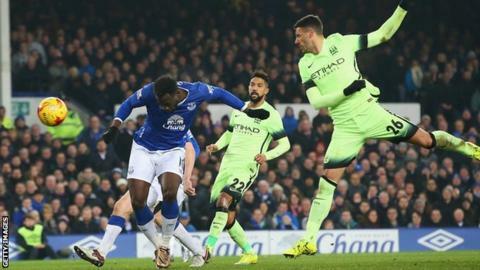 Everton hold the advantage in the League Cup semi-final against Manchester City after Romelu Lukaku's 19th goal of the season gave them a victory in the first leg at Goodison Park. City looked to have secured a draw with 14 minutes left, when Jesus Navas finished a sweeping counter attack following brilliant work by Sergio Aguero. That equaliser cancelled out Ramiro Funes Mori's opener for Everton on the stroke of half-time. Argentine Funes Mori pounced after Willy Caballero saved Ross Barkley's shot - although City were nursing an understandable sense of injustice with Lukaku standing in an offside position in front of the keeper. Everton refused to be sunk by Navas' sucker punch and responded within two minutes, Lukaku heading in his 12th goal in 12 games from Gareth Barry's perfect cross. Everton had efforts from John Stones and Lukaku rightly ruled out for offside - and it looked like a case of third time lucky for Martinez's team when Funes Mori struck just before half-time. Caballero did well to block Barkley's shot, even though the giant figure of Lukaku was clearly standing offside, and appeared to be in the City keeper's line of vision. Lukaku did not touch the ball, and did not appear to make a movement towards it, so the debate centred on whether he was interfering with an opponent by obstructing Caballero's view. Referee Robert Madley waved away City's protests and Everton grasped at their good fortune - but the visitors had every right to feel they were hard done by. That was not the only frustration for City manager Manuel Pellegrini, who felt his side had a strong penalty appeal rejected when Navas went down under a Kevin Mirallas challenge. "Everton's first goal was absolutely offside and it was a clear penalty when Jesus Navas was fouled," Pellegrini said. "I didn't speak to the referee after the game - they were both clear. "To lose 2-1 is a bad result but it just means we have to win 1-0 at home. I still think we are able to play in the Capital One Cup final." Under the old rule, a player was allowed to stand in an offside position as long as they were deemed to be not actively interfering with play. But under this season's changes, a player will now be ruled offside if they clearly make an attempt to play the ball, or if the offside player makes an action which impacts his opponent's ability to play the ball. When the 34-year-old former England midfielder struggled last season, many thought this model professional's distinguished career at the top was coming to a close. Barry has demonstrated that reports of his demise were greatly exaggerated by having an outstanding campaign this term - and all that experience was on show here. He was the perfect partner for the abrasive, energetic Mo Besic, the rough diamond whose early tackling and positive approach kept Everton going through a slow start and roused a subdued Goodison Park. Barry, in turn, showed all his class as he strode through midfield making crucial interceptions, breaking up play and barely wasting a pass. Barkley had a frustrating evening further forward but once again he never stopped driving at City's defence and epitomised Everton's approach after the early exchanges, even though he promised more than he delivered, with several strikes either wide of the target or saved by Caballero. While Barry and Besic ran the show around him, City midfielder Yaya Toure looked every day of his 32 years and more besides. A lumbering figure, he had no impact on the game and his contribution was summed up when an attempted forward run in the first half was halted by the pace and power of Besic, who caught the giant Ivorian to tackle and rob him, leaving him stranded on the ground. Even as City chased their way back into the game in the second half, Toure was nowhere to be seen. Normally such an influence, he was little more than a passenger. Toure is still capable of moments of brilliance, as he showed when scoring in Saturday's win at Watford - but are the years finally catching up with the man who has been City's talisman so often? Lukaku has netted four goals in five League Cup appearances this season. Navas scored his first goal for City since September 2014 (v Sheffield Wednesday) - a wait of 66 games in all competitions for the club. This is the first time Pellegrini has lost to Everton as Manchester City boss (W4 D1). Roberto Martinez won just his second game against Manchester City as a manager, the other being the 2013 FA Cup final (W2 D2 L11). Both teams are in FA Cup action this weekend, with Everton hosting Dagenham and Redbridge, and Manchester City travelling to Norwich. City and Everton meet again in the Premier League at Etihad Stadium next Wednesday. Match ends, Everton 2, Manchester City 1. Second Half ends, Everton 2, Manchester City 1. Offside, Manchester City. Fernandinho tries a through ball, but David Silva is caught offside. Substitution, Manchester City. Fernando replaces Kevin De Bruyne. Seamus Coleman went off injured after Everton had used all subs. Delay in match Seamus Coleman (Everton) because of an injury. Attempt saved. Muhamed Besic (Everton) right footed shot from outside the box is saved in the centre of the goal. Assisted by Ross Barkley. Foul by Leon Osman (Everton). Substitution, Everton. Arouna Koné replaces Romelu Lukaku because of an injury. Attempt missed. Jesús Navas (Manchester City) right footed shot from the right side of the box is high and wide to the right. Assisted by Fernandinho. Goal! Everton 2, Manchester City 1. Romelu Lukaku (Everton) header from the centre of the box to the centre of the goal. Assisted by Gareth Barry with a cross. Goal! Everton 1, Manchester City 1. Jesús Navas (Manchester City) left footed shot from the left side of the box to the bottom right corner. Assisted by Sergio Agüero with a through ball following a fast break. Attempt blocked. Leighton Baines (Everton) left footed shot from outside the box is blocked. Assisted by Leon Osman. Corner, Manchester City. Conceded by Joel Robles. Attempt saved. Kevin De Bruyne (Manchester City) right footed shot from outside the box is saved in the bottom right corner. Assisted by Sergio Agüero. Corner, Everton. Conceded by Martín Demichelis. Substitution, Everton. Kevin Mirallas replaces Gerard Deulofeu. Attempt saved. Ross Barkley (Everton) left footed shot from outside the box is saved in the centre of the goal. Assisted by Muhamed Besic. Attempt blocked. Yaya Touré (Manchester City) right footed shot from long range on the left is blocked. Assisted by Kevin De Bruyne. Corner, Manchester City. Conceded by John Stones. Corner, Everton. Conceded by Willy Caballero. Attempt saved. Ross Barkley (Everton) right footed shot from the left side of the box is saved in the centre of the goal. Attempt saved. Fernandinho (Manchester City) header from the centre of the box is saved in the top left corner. Assisted by Jesús Navas with a cross. Corner, Manchester City. Conceded by Leighton Baines. Attempt blocked. Sergio Agüero (Manchester City) right footed shot from the centre of the box is blocked. Attempt missed. Sergio Agüero (Manchester City) left footed shot from the centre of the box is high and wide to the left. Offside, Manchester City. Gaël Clichy tries a through ball, but Kevin De Bruyne is caught offside. Offside, Everton. Leighton Baines tries a through ball, but Leon Osman is caught offside. Attempt missed. Gaël Clichy (Manchester City) header from the centre of the box is close, but misses to the left. Substitution, Manchester City. Jesús Navas replaces Fabian Delph. Attempt saved. Muhamed Besic (Everton) right footed shot from outside the box is saved in the bottom right corner. Assisted by John Stones.